A slice of Americana often thought of with respect and even nostalgia is the family business, an increasingly rare yet ever-robust reflection of the American spirit. The joys and challenges of building and maintaining a family enterprise successfully are evident in any field of commerce, but perhaps most especially in golf. The importance that family-owned golf courses hold in their communities has only increased with time. Golf Business introduced its readers to just such a family 20 years ago in the April 1999 cover story, A Diamond in the Rusk. Today, the Raiborn family still owns and operates their public, nine-hole golf course in the rolling hills of East Texas. 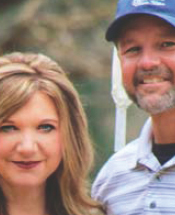 “All our members and daily golfers are like a whole extended family to us,” says Angela Raiborn, 46, co-owner with her husband, Mark, of Birmingham Golf Club in the small town of Rusk, population 5,500. “Our kids are grown now, but we never had to put them in daycare; I could just be there with them. The course was built in 1967, the identity of its designer unknown. Mark, whose father taught him to play golf at age 10, knew that his dad had tried unsuccessfully to purchase the golf course, known until last year as Birmingham Forest Golf Club. Mark worked at the course throughout high school, learning every aspect. He and Angela, who met in high school, married in 1991, had the first of their three children in 1993 and purchased the golf course in October 1994. For years the clubhouse was a small portable building, a former school house that the Raiborns bid on and moved to the site. The family lived nearby but spent all their waking hours at the golf course. Mark convinced Angela that they should move on site. So they added 1,000 square feet to the clubhouse as their living quarters, where they’ve been ever since. “She loves it now,” Mark says. A neighbor owns the 15-acre lake visible from the clubhouse. Angela runs the pro shop, while Mark offers instruction and maintains the grounds and equipment. Their children, now all in their 20s, help out when they can. No tee times are required; members and local golfers know they can just show up and play any time. There are several tees to choose from, accommodating players of every skill level. To play 18 holes, golfers play the nine twice, usually approaching the second nine from a different tee. The demands of administering every aspect of Birmingham Golf Club are many, but the Raiborn family puts them in perspective, considering the major challenges they have faced. In the summer of 2005, the wooden golf-cart sheds caught fire. “It was devastating,” Mark says. “We lost all 54 individual sheds. A loan was secured and the sheds were rebuilt, of metal and much better quality this time. That would have been challenge enough for any family. In 2008, however, the Raiborns faced what could have ended in tragedy. “Armadillos had been digging on our greens and tee boxes during the dry weather,” Mark says. “I was coming in from hunting them when my spotlight quit working. The gunshot hit Mark in the head, fracturing his skull but not penetrating it. After six days in intensive care and three weeks in rehabilitation, he recovered fully. “It’s a miracle,” Mark says. “Since then I haven’t hunted for armadillos, but I haven’t had a problem with them since then. Mark appreciates the fact that he never had to miss his children’s ball games or activities. Either he or Angela usually has been on site, sometimes aided by local high-school students who work part time. “We’ve been able to put all three of our kids through college,” Mark says. The challenges continue, as with any golf course. “Golf is a roller coaster,” says Mark. “There are good times and bad. “Rusk is a blue-collar town; people don’t have a lot of money to spend on recreation. But we are seeing growth in and around Rusk. About 6,300 rounds of golf were recorded at Birmingham Golf Club in 2018, down about six percent from 2017. Otherwise, overall rounds have been fairly steady each year. The Raiborns believe the dip last year was for the most part weather-related, as Rusk had a winter and early spring that were wetter and colder than average. In addition, the nearest 18-hole course (about 15 miles away) lowered its rates, which may have affected Birmingham’s rounds somewhat. The Raiborns advertise in the local weekly newspaper, the Cherokeean Herald, the oldest weekly newspaper in Texas. They publicize tournament results and golf-course specials on social media. And they create flyers and email blasts to reach even more golfers. The fee is $16, with cart, to play nine holes on a weekday, $20 for 18 holes. On weekends, the fee is $20 with cart for nine holes and $23 for 18. Two weekly games are available for anyone to play in, a Tuesday shamble and a Thursday scramble. The cost is $20, including cart. Mark, who is an instructor for The First Tee of Tyler, offers three-day, three-hour-a-day junior clinics at Birmingham Golf Club for $50 per child, including snacks and drinks. The Raiborn family recently formed Birmingham Golf LLC, upon their accountant’s recommendation, to protect their assets. And not long ago, Angela began planting vegetables and having animals on site for youngsters to enjoy, such as goats and chickens, which also provide fresh eggs every day for the family. Both Mark and Angela wear several hats. Mark’s work is mostly at the golf course, while Angela has extended her talents beyond the facility. Since 2007 she has served as mayor of Rusk, having been re-elected every two years. The pay is nominal, but she finds it fulfilling. “It’s a good experience,” Angela says. “We have a talented city manager and staff who take care of day-to-day operations. In November of last year, Angela also began working for CASA (Court Appointed Special Advocate), having formerly served as a volunteer. Her job is to check on children who have been placed with family members or in foster homes, communicating with their teachers or daycare providers to make sure they are in a safe environment. As for the upcoming golf season, Angela says, “Mark and I are trying to figure out how to juggle everything. Two of our kids have flexible schedules, as I do. Putting into perspective all the ups and downs the Raiborns have known as proud owners of Birmingham Golf Club, it is certain that their new challenges also will be met with grace and determination. After all, golf is a game for a lifetime. Sally J. Sportsman is an Orlando, Florida-based freelance golf writer.